BUILDING on the success of their first year, DIY-pop favourites Mr Ben & the Bens are releasing two of their most popular songs on a limited 7”. The release comes just as the band embarks on its second headline tour of the UK in just a few months. Released on Bingo Records, the Nova Scotia 7” sees the band put out two live favourites, along with a vinyl-only bonus track. It showcases a band known for their excellent live show taking that chemistry into the studio and recording as a unit for the first time. Ben explained: “The tracks were recorded over a four-day holiday in Margate at PRAH Studios. We arranged the songs as a live unit and recorded them in the same way. We used loads of percussion and old analogue synths; going for a new wave sort of sound inspired by power pop and Elvis Costello. “Nova Scotia is about finding footage of a festival in Halifax, Nova Scotia called Pop Explosion on YouTube, which is still going. I saw videos of the festival in the 90s and it seemed like a real destination for alternative art and music with people travelling from all over the world to be there. “I love the idea of fringe places becoming the centre of something, so I guess that song is about learning about that, but also about being able to do it from the comfort of my bedroom in this information age. 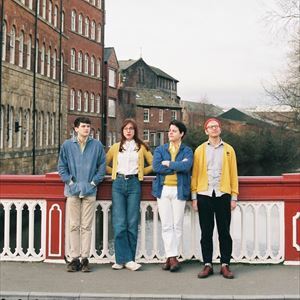 Mr Ben & the Bens broke through in 2018, receiving regular airplay on BBC 6 Music and performing live in session on Marc Riley’s 6 Music show three times. Speaking of his music, Mr Ben said: “This project was born in a barn in northern Lancashire in 2012. The band has also been played on a number of other UK radio stations, as well as across the world in America, Canada and Australia. Last year they had their first headline UK tour.They have also played with The Wave Pictures, The Lovely Eggs and British Sea Power, earning great numbers of fans along the way. Nova Scotia comes as a limited edition coloured vinyl in a screen printed PVC sleeve. Included is a zine, artwork and a number of other special items. Another secret track is also included on the vinyl, and will only be released in the physical format. It is due for release on April 13, 2019.